Share "Sleep Deprivation in Horses"
Horses do not need the same amount of sleep humans do, but do need three different types of sleep – the slow drowsy period of initial relaxation, deeper slow wave sleep and rapid-eye-movement sleep. Depending on the horse's age and activity level, 3-5 hours of total sleep each day is sufficient, but they must have sleep in each stage, and if they are unable to reach each type of sleep, they can become sleep deprived. Because horses are migratory herd animals, they can often skip adequate sleep for several days – a defense mechanism they've adapted to – but will gradually suffer ill effects if they continue to go without sleep. Sleep deprivation can be difficult to diagnose in horses, especially if the animals are boarded and may not be under constant supervision. Drowsy, sluggish behavior can be one symptom, and a horse that is on the edge of falling asleep may trip or completely collapse only to jerk awake suddenly. Unexplained scrapes or cuts on the horse's knees, nose and head may be signs of such collapses. 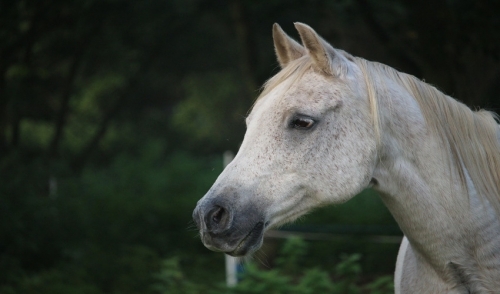 Horse owners should also check the horse's coat for dirt or debris that can indicate the horse has lain down recently. If the horse is not lying down anymore, it may not be sleeping. There are different reasons why horses might not be sleeping well, but many problems can be overcome with simple solutions to help horses get rested. There is no place comfortable to sleep. The horse's stall should be large enough to allow the animal to lie down easily without bumping into walls or equipment. The stall's bedding should be fresh, clean and deep enough to be comfortable as well. If the horse is kept in a corral, there should be a comfortable shelter or windbreak available so the animal can sleep with some protection from the elements if desired. It hurts too much to lie down. If it is painful for the horse to get up or down for sleep, the animal may prefer to stay awake rather than suffer such discomfort. Senior horses may have joint pain or arthritis in their knees that makes getting up or down too taxing, or horses with leg injuries could have the same difficulty. Abdominal distress may also be too uncomfortable for sleep. All of these injuries should be appropriately treated to make the horse more comfortable and allow it to sleep. There is too much unexpected noise for good sleep. Horses can be easily startled by loud noises, such as construction equipment, barking dogs, building alarms or similar sounds. A new building project near a horse's corral may keep the animal from sleeping, or a loud dog that barks excessively could prevent good sleep. Minimize these and similar distractions near the barn or corral as much as possible to allow the horse to sleep better. The environment is unfamiliar and may be frightening. Horses derive comfort from familiar situations and routines, and if they are suddenly put into an unknown situation, they may be too anxious or upset to sleep properly. An extended stay at a show, track or fair, with unfamiliar animals, strange smells and noises, unknown spaces and other potentially scary distractions can keep a horse wide awake. In time, horses may adjust to the new environment, but they can become severely sleep deprived before that happens. The horse does not feel safe and secure. Because horses are herd animals, they are used to being in a community. That includes having a lead mare or stallion that will stand guard over the herd, allowing other community members to sleep without fear of predators or other dangers. If a horse is suddenly kept in a corral alone, it may be too nervous to sleep. Other horses are picking on the newcomer. Horse herds have a loose hierarchy, and a horse that has been newly introduced to the herd is generally lowest on the pecking order. This may allow other horses to chase, bite or otherwise harass the newcomer, never allowing them to sleep comfortably. Breaking up a herd to shift that hierarchy can help a new horse fit it better. No matter what the reason a horse may not be sleeping well, there are steps that can be taken to resolve problems and provide a safe, comfortable, refreshing night's sleep. If addressing these issues does not allow the horse to rest adequately, an experienced veterinarian should be consulted to check for other potential problems, including narcolepsy or other severe sleep disorders.